Total: 1 hr. 20 min. Fresh berries, ripe avocados, and toasted pecans surround braised lamb for a perfect meal on a hot summer's eve. In large skillet with cover, heat oil over high heat. Brown lamb on all sides. Add 2 cups water. Cover and braise over low heat for 1 hour. Cool in liquid. Remove from liquid. Refrigerate or freeze remaining liquid for use in stock for soup. Cut meat into 1-inch pieces, removing all fat; set aside. 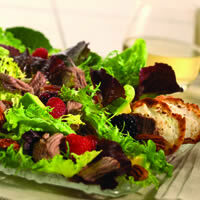 In salad bowl, combine greens, berries, pecans, and avocado; set aside. Mix lamb with salad dressing. Toss with salad. Serve salad on plates and garnish with two slices of baguette.